It shouldn't have been surprising, really, that the world's most populous continent would give birth to a movement called People Power. 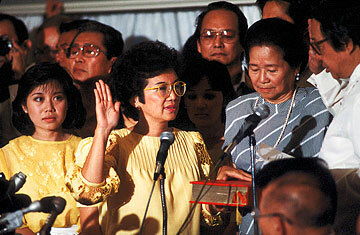 In 1986, a housewife from the Philippines whose given name meant "heart" gave lifeblood to her wounded nation. The only weapon she possessed was moral courage. But with it she discovered a groundbreaking truth: that a populace holding nothing more than candles and rosary beads could face a cavalcade of tanks, topple a dictator and, most improbable of all, usher in democracy.